After the events of the 2018 playoffs, the Trail Blazers could only bide their time. Whatever Portland accomplished in this regular season would be met with (and muted by) reservation, as tends to be the response to a spectacular flameout. The Blazers had entered their first-round series against the Pelicans last April as a seeded favorite. They left it thoroughly dismantled and exploited for their core concepts. A defeat like that forces an entire franchise to look inward, not only for a hard look at the personnel involved, but also the processes that brought the team together in the first place. When the smoke cleared, Portland elected to try again with its roster largely intact. It would be a long road back to April. 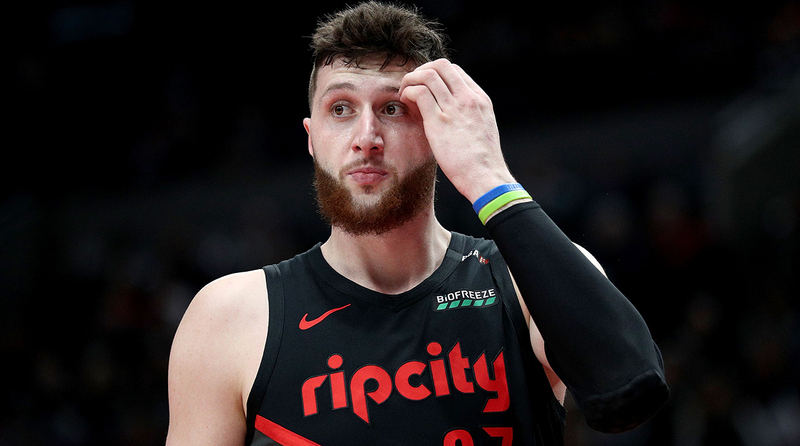 Never was that more clear than on Monday night, when Jusuf Nurkić—an utterly crucial Blazer having a career year—suffered a season-ending injury in the 55th minute of a double-overtime game. The result of that game was meaningful, but not so much as the gruesome compound fractures in Nurkić’s left leg. An injury like that has the power to completely change an organization. Damian Lillard is already in his seventh year with the Blazers, most of which has come alongside this core of teammates. You only get so many tries. A coach—even one as good as Terry Stotts—only gets so many early playoff exits. The reasoning for those exits matters, though sometimes the pressure to make change matters more. These are the stakes of winning and losing in the NBA, and they can be swayed to an incredible and absurd degree by something as faultless as a break in the leg of a seven-footer. Tonight, the Blazers will begin their campaign against circumstance. Portland will need to settle on a replacement for Nurkić in the starting lineup, which is already without C.J. McCollum. Those compounding injuries will stress test the roster; not only will Portland’s backup centers and guards have greater responsibility, but forwards like Al-Farouq Aminu, Maurice Harkless, and Jake Layman—the ballast of the team—will need to fill gaps and keep unfamiliar lineups together. Little will come easy. What brought Portland’s downfall last April was its lack for playmakers. When New Orleans trapped Lillard, too many of his passes out of pressure went nowhere. Now he’ll be without two of his safest outlets, undermining much of the progress the Blazers had made in the past year. Portland had been getting by in McCollum’s absence by leaning on Seth Curry and Rodney Hood, but another lineup concession could prove costly. The best of the Blazers coincided with Nurkić’s time on the floor for a reason. There aren’t many centers who can hold their own defensively, punish mismatches, facilitate an offense, and tilt the balance on the glass. Nurkić had established himself as that kind of force, and in his time on the floor, Portland was a better team across every one of the four factors on both offense on both offense and defense. Without him, they’ll be left to juggle the limitations of Enes Kanter, Zach Collins, and Meyers Leonard. It could be worse, though that doesn’t mean it won’t be painful. Losing Nurkić is far more costly than losing his 15.6 points, 10.4 rebounds, 3.2 assists, and 1.4 blocks per game. No other big on Portland’s roster is as comfortable making a catch out of the pick-and-roll and finding the next open player in sequence, which limits how the Blazers can run their offense. It will be easier for opposing defenses to switch away from the ball without the threat of Nurkić bulldozing his way to a score, which boxes in players like Curry and Hood as they try to spring open. The Blazers also lose their most abusive screener, and in that, a mechanism for Lillard to be the kind of passer they need him to be. Lillard has been racking up assists of late, but like many guards, he’s at his playmaking best when working downhill. Give Lillard a stern ball screen and he’ll force a defense into some reluctant rotations—the kind that scramble their coverage and leave a shooter open in the corner. Without that, Lillard could wind up throwing more of the long, lofting passes that come with greater risk and lesser rewards. The rest of Portland’s season will come down to the way it manages those sorts of hyper-specific deficits. Collins has great shot-blocking instincts, but can the defense—which was already fairly average—hold if he can’t hold his ground? Will the trickle down of Nurkić’s touches to less capable scorers shave down the Blazers’ efficiency? Lillard will have to do so much just to keep Portland competitive until McCollum returns, and at what cost to his defensive effort or his late-game shooting? Playing without Nurkić means playing with fewer options. It paints an already delicate offense into a corner, and forces what was a solid rotation to compromise. A defensive drag like Kanter, for example, can only be valuable if his team dictates when and how much to play him. Stotts has less say in the matter today than he did two days ago, and that’s only the beginning of his troubles. It’s a cold reality of the game that Portland’s deliberate response to a playoff embarrassment now comes to this. There are nine games remaining on the Blazers’ schedule, each a critical trial for redefinition. Time can be cruelly fleeting. After grinding for a year for another chance, counting the days until the end of the season, it finally approaches in a time and manner that denies resolution.